Mouse anti Human Laminin Alpha 5 antibody, clone 4C7 (5620-0436) used for the identification of alpha-5 laminin from JAR choriocarcinoma cells by immunopercipitation. Expression and synthesis of laminins by JAR cells. A) JAR choriocarcinoma cells transcribe lm α1, lm α3, lm α5, lm β1, lm β2, lm β, lm γ2, and lm γ1 chains as shown by RT-PCR. As a reference sample, we used optimized, in-house prepared positive control mix, which contains cDNA from undifferentiated hPSCs, spontaneously differentiated hPSCs as well as from isolated human pancreatic islets. 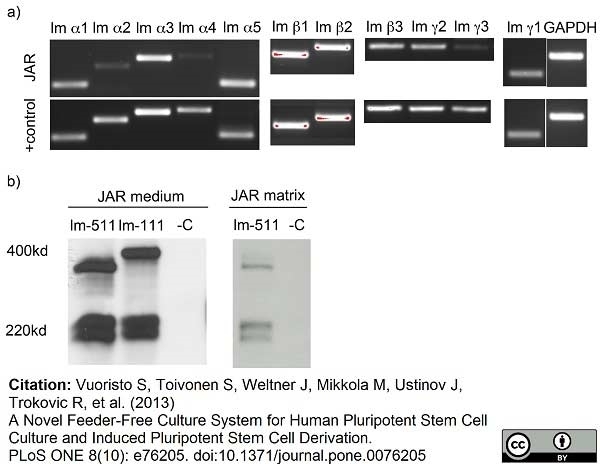 B) JAR choriocarcinoma cells were metabolically labeled with 35S and the cell culture supernatant and matrix deposited by JAR cells were immunoprecipitated using antibodies, which specifically recognize the human lm α1 (400 kDa) and lm α5 (350-380 kDa) chains. The cells showed abundant lm-511 and -111 synthesis. A Novel Feeder-Free Culture System for Human Pluripotent Stem Cell Culture and Induced Pluripotent Stem Cell Derivation. Mouse anti Human Laminin Alpha 5 antibody, clone 4C7 (5620-0436) used for the identification of lamanin alpha-5 by western blotting. Reactivity of novel mAbs to LMα5 chain as measured by ELISA, Western blotting and immunoprecipitation. A) Reactivity of the antibodies with rhLMs 411, 511 and 521 by ELISA. B) Reactivity of the antibodies with rhLM511 by Western blotting under reducing conditions. C) Ability of the antibodies to immunoprecipitate laminin-511 from A549 cells' conditioned medium and detection of the LMα5 chain by Western blotting with mAb 4B5. Bands of 300/350 kDa corresponding to LMα5 chain were detected with some of the antibodies. A Novel Monoclonal Antibody to Human Laminin α5 Chain Strongly Inhibits Integrin-Mediated Cell Adhesion and Migration on Laminins 511 and 521. Mouse anti Human Laminin Alpha 5 antibody, clone 4C7 (5620-0436) used for the evaluation of lamanin alpha-5 expression in human kidney by immunohistofluorescence on acetone fixed cryosections. Immunohistochemical reactivity of mAb 8G9 in comparison to mAb 4C7 against LMα5 chain. (A) and (C), mAb 4C7; (B) and (D), mAb 8G9 against frozen sections of human kidney (A) and (B), and skin (C) and (D). The staining pattern of the two antibodies was indistinguishable. In kidney, the antibodies stained glomerular and tubular basement membranes, whereas in skin, reactivity with epidermal and vascular basement membranes was observed. Mouse anti Human Laminin Alpha 5 antibody, clone 4C7 recognizes the laminin alpha 5 chain also known as Laminin-10 subunit alpha, Laminin-11 subunit alpha or Laminin-15 subunit alpha. Laminin is a complex glycoprotein composed of three polypeptide chain complexes. Laminin alpha 5 is expressed in heart, lung, kidney, skeletal muscle, pancreas, retina and placenta, there is little or no expression in brain and liver. Engvall, E. et al. (1986) Mapping of domains in human laminin using monoclonal antibodies: localization of the neurite-promoting site. J Cell Biol. 103 (6 Pt 1): 2457-65. Ido, H. et al. (2006) Probing the integrin-binding site within the globular domain of laminin-511 with the function-blocking monoclonal antibody 4C7. Matrix Biol. 25 (2): 112-7. Chang, C. et al. (2015) A laminin 511 matrix is regulated by TAZ and functions as the ligand for the α6Bβ1 integrin to sustain breast cancer stem cells. Genes Dev. 29 (1): 1-6. Zamurs, L. et al. (2013) Chain-specific antibodies for laminin-511. Growth Factors. 31 (6): 209-19. Tiger, C.F. et al. (1997) Presence of laminin alpha5 chain and lack of laminin alpha1 chain during human muscle development and in muscular dystrophies. J Biol Chem. 272 (45): 28590-5. Pouliot, N. & Kusuma, N. (2013) Laminin-511: a multi-functional adhesion protein regulating cell migration, tumor invasion and metastasis. Cell Adh Migr. 7 (1): 142-9. Schaff, M. et al. 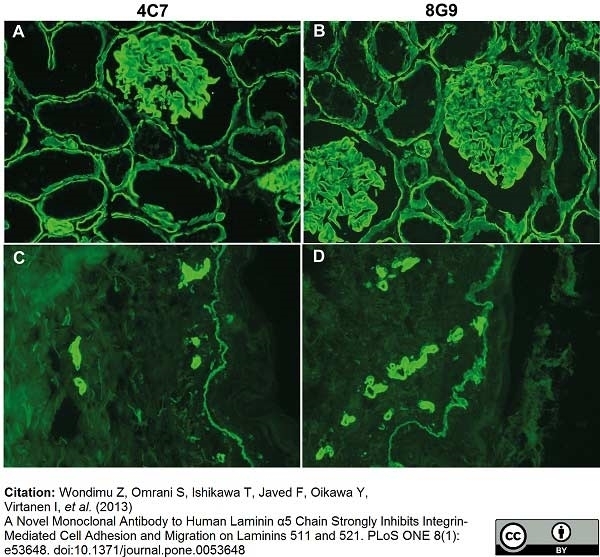 (2013) Integrin α6β1 is the main receptor for vascular laminins and plays a role in platelet adhesion, activation, and arterial thrombosis. Vuoristo, S. et al. (2013) A novel feeder-free culture system for human pluripotent stem cell culture and induced pluripotent stem cell derivation. PLoS One. 8 (10): e76205. Wondimu, Z. et al. 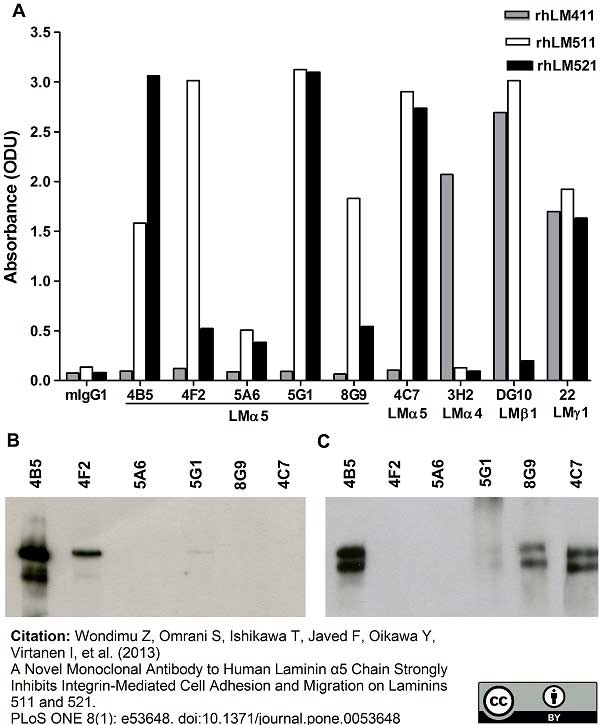 (2013) A novel monoclonal antibody to human laminin α5 chain strongly inhibits integrin-mediated cell adhesion and migration on laminins 511 and 521. PLoS One. 8 (1): e53648. Breitkreutz, D. et al. (2013) Skin basement membrane: the foundation of epidermal integrity--BM functions and diverse roles of bridging molecules nidogen and perlecan. Biomed Res Int. 2013: 179784.